Roasted Beets and Sweets in Brown Butter Maple Glaze are going to be your go-to side dish for Thanksgiving, Holidays or any dinner at home! Don’t save this side dish for just Thanksgiving, you’re going to want to make it a lot more often than that. All the sides for Thanksgiving kind of make the whole dinner, don’t you think? With the artichokes and mashed potatoes, stuffing for sure – lots of stuffing…the more sides the better! But you do also need to not pass out on the floor before your guests arrive from cooking for 3 days so this Roasted Beets and Sweets in Brown Butter Maple Glaze is going to be a life saver. 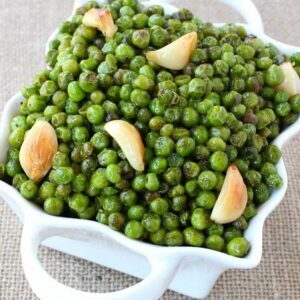 Simple vegetable side dish with a totally amazing flavor, and also not 10 sticks of butter in the recipe…just one. Yep, there’s a whole stick of butter in this recipe but there are also a LOT of potatoes and beets going on here. This is going to serve at least 6, but I’ll say your safe with serving 8 if you’ve got a lot of other sides going on too. 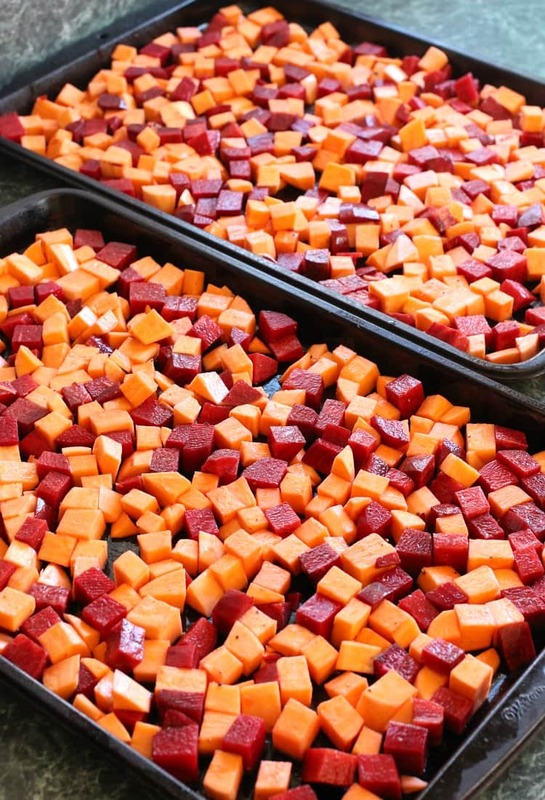 Start out by peeling and cubing the potatoes and beets. This will be the most time consuming part of the recipe but still it only took about 15 minutes. 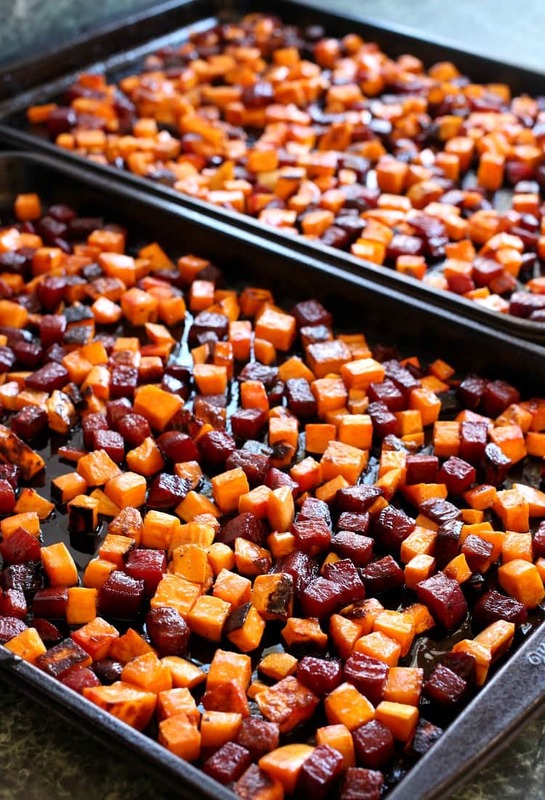 Toss the beets and sweet potatoes with salt and pepper and oil and roast for 30 minutes. While they’re in the oven you can make the brown butter maple glaze. Sounds a lot more fancy than it actually is but it’s only 3 ingredients and about 5 minutes. 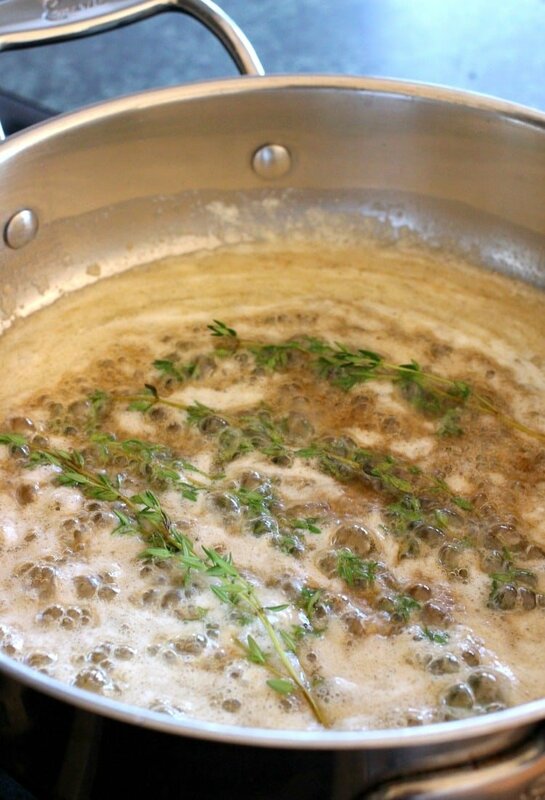 A whole stick of butter goes into the pan with 3 or 4 thyme sprigs…wait until that butter gets brown, add in the maple syrup and remove it from the heat. Take the potatoes and beets out of the oven after the 30 minutes are up and toss them in the brown butter glaze, snack on a few, then get them back into the oven. I’m going to say on the level of indulgent foods at a Thanksgiving table these Roasted Beets and Sweets in Brown Butter Maple Glaze are way down there on the list. But crazy high in flavor! We’ll be making this vegetable side dish all year because it’s that good! 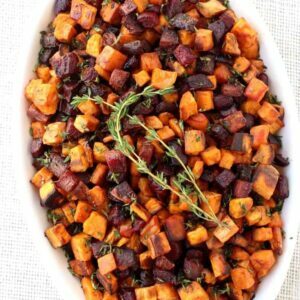 Roasted beets and sweet potatoes with a buttery sweet glaze that is a delicious side dish to any meal! Preheat the oven to 435 degrees. 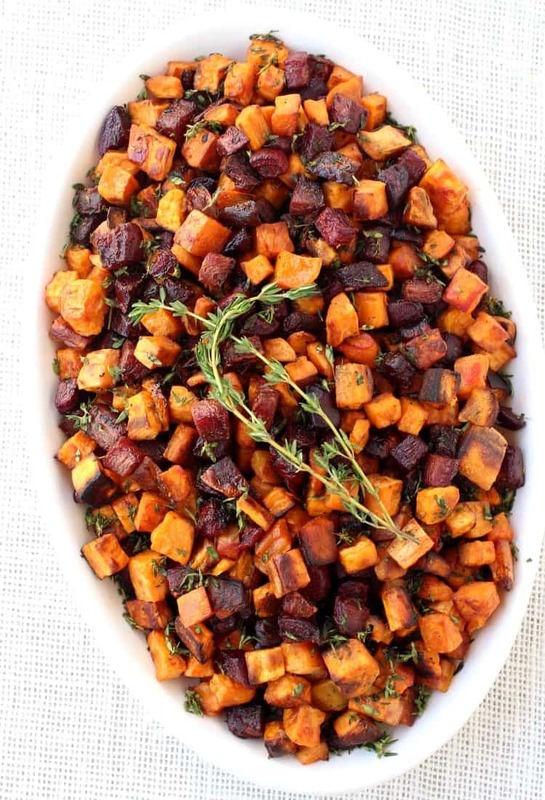 In a large bowl, toss together the beets, sweet potatoes, salt and pepper. While the potatoes and beets are in the oven, make the brown butter glaze by adding 1 stick of butter to a skillet along with the fresh thyme sprigs. Melt the butter down until just browned (about 5 minutes) then stir in the maple syrup and remove from the heat. After 30 minutes, remove the potatoes and beets from the oven and toss with the brown butter glaze. Place back in the oven for 15 minutes then remove to a large serving plater and garnish with the two tablespoons of reserved chopped thyme. Thanks Cheryl, I’m working on it! First of all this is GORGEOUS!! And the flavors are perfection. Now off to check out your whiskey brussel sprouts. Thank you Kristen – the sprouts are good too…let me know how you like them! 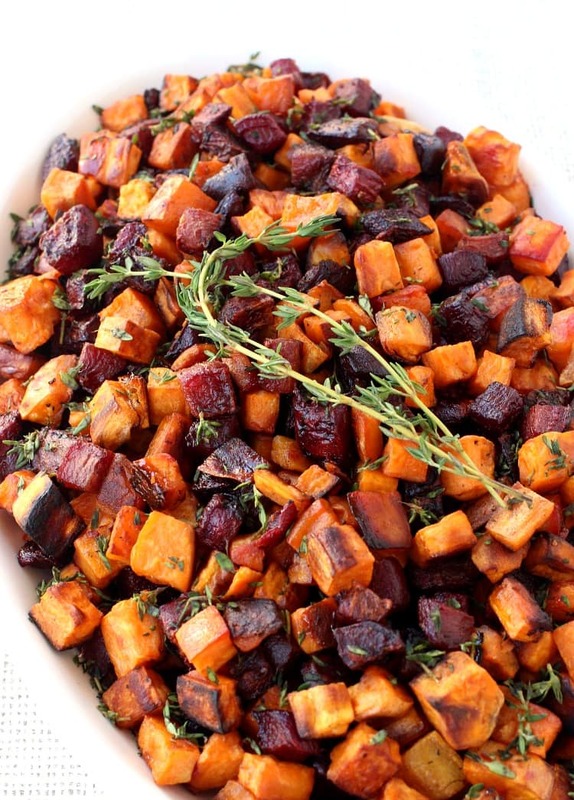 This is the perfect fall side dish!! That sounds amazing! Love the colors! This is so pretty and sounds so good! Do you think I could get similar if not the same result in a crock pot? Without knowing the end result consistency, I’m a tad hesitant, but it sure would be an over-space-saver on Thanksgiving. Liz, I don’t think it would work in the slow cooker. The best part about these is the crispy outside you get from roasting them in a hot oven…I think in the slow cooker they would just be mushy. What you could do though is get them all ready for the oven and once you pull out your turkey you can throw these in. By the time your turkey rests and gets carved these will be done! We are too! I’m so glad you liked it! I have made these twice. 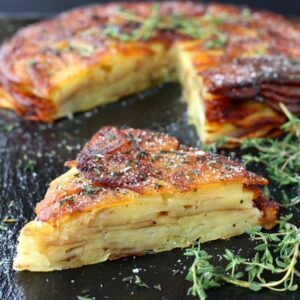 It’s such an easy side dish, and they are so gorgeous! I go a little easier on the butter, and they still taste delicious. 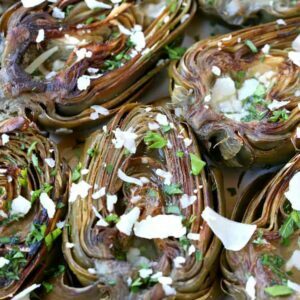 His is a perfect Thanksgiving side dish, but it also makes a great addition to a brunch or ordinary weekday dinner. Thanks for sharing the recipe. So glad to hear it Joyce, my boys love when we make this! My entire dish turned red from the beets. How could that have been prevented? I’m not sure why that happened, Natalie. You were using raw beets, right? Maybe just keep them separate before roasting, then when you toss them after the first 15 minutes with the butter it should be fine. Do you think a substitution of butternut squash would work? I bought that and beets and then decided to look at recipes.